HUM Flatter Me is a digestive enzyme supplement, that claims to improve gut health and prevent issues such as bloating, indigestion, and feelings of fullness for weight loss. The idea of taking HUM Flatter Me is that this supplement will redress your digestive enzyme balance so that you not only look thinner, but feel healthier too. Plus, it’s vegetarian-friendly! No comments Page updated Apr 11, 2019. First published Mar 22, 2019. For many of us, carrying excess fat on the stomach is the number one weight issue! HUM Flatter Me proposes a way to flatter your shape by flattening your stomach with this digestive enzyme supplement. So, does it work? Let’s take a look. HUM Nutrition is a nutritional supplements company based in California that is all about looking good through inner fitness. The company motto is “beauty starts from within”. HUM Nutrition supplements are on sale from the HUM Nutrition website and via Amazon. HUM Flatter Me is a digestive enzyme supplement. It is supposed to improve digestive issues such as bloating, but there is no real evidence that it will work as described and scientists have criticised OTC digestive enzyme supplements, saying they just don’t work. HUM Flatter Me contains 60 capsules a bottle so is sufficient for one month’s supply. This supplement is less expensive if you buy directly from the HUM Nutrition website, and the company also offers discount codes and special offers. What are the side effects of HUM Flatter Me? A few customers have mentioned side effects including bloating and nausea. Other side effects of digestive enzymes may include diarrhoea, abdominal cramps, headaches, and skin rash. How much does HUM Flatter Me cost? HUM Flatter Me is quite expensive, especially if you buy via Amazon where it costs around $45.00 per bottle of 60 capsules (30 days supply). Buy from the HUM Nutrition and it is a bit cheaper at $25.00 for 60 capsules. Shipping is a further $5.95 to US addresses on orders less than $50.00. HUM Nutrition do ship internationally for a flat rate fee of $10.95. If you complete an online questionnaire on the HUM Nutrition website, you can obtain a $10.00 off promotional code. HUM Flatter Me is a supplement that claims to improve gut health and prevent issues such as bloating, indigestion, and feelings of fullness. The supplement contains a proprietary digestive enzyme blend to help break down proteins, fats, carbs, milk, sugar, and fibre – all the major food groups. There is also a herbal blend of ingredients often taken for digestive issues, which contains peppermint, ginger, and fennel seeds. Check out the ingredients tab to find out more. Enzymes are molecules in the cells that speed up chemical reactions in the body, and they are essential for all bodily functions including breathing, the muscles, the nerves, and everything else. They act as a catalyst for these chemical reactions and without them, the body could not function. Digestive enzymes are the group of enzymes that help the body break down food into smaller components so that they can be absorbed by the body. There are thousands of enzymes in the human body each with a specific role in helping your body process food. You also obtain digestive enzymes by diet. However, the belief is that many people lack sufficient digestive enzymes and that digestive enzymes reduce with age. This can lead to common issues such as bloating, feelings of fullness, Irritable Bowel Syndrome, and lactose intolerance, to name a few. The idea of taking HUM Flatter Me is that this supplement will redress your digestive enzyme balance so that you not only look thinner, but feel healthier too. We covered HUM Daily Cleanse and HUM Skinny Bird in previous reviews. HUM Nutrition Inc is based in California. Contact details are provided. The customer phone line is (888) 647-8880, and the provided address is Healthy Towers, 750 N. San Vicente Blvd, Suite 1550, West Hollywood, CA 90069. What does HUM Flatter Me claim to do? The supplement is suitable for vegetarians and may help reduce your stomach size. It may help remedy digestive issues as well. Does HUM Flatter Me work? There are no guarantees that HUM Flatter Me will work as described. Although digestive enzymes are important to health and digestion, the supplement market is unregulated and there are no guarantees that an OTC supplement will remove the bloating and digestive distress as claimed. Digestive enzymes are sometimes prescribed for health issues, but taking a general purpose digestive enzyme supplement may not provide any real benefits. Serving size is equal to one capsule. The measurements provided in the various enzyme blends refer to the potency or activity of the enzyme, and cannot be converted to weight (mg). These abbreviations refer to the standard Food Chemical Codex which measures the activity levels of each component. It is good that the label provides accurate information. It is not so good that nobody apart from specialist scientists can understand it! To Break Down Protein: Protease 3.0 (15 SAPU), Protease 4.5 (20,000 HUT), Peptidase (2, 500 HUT) Bromelain (650,000 FCCPU), Neutral bacterial protease (20,000PC), Papain (FCCPU). Proteases are digestive enzymes that break down proteins. There are around 500 different types of protease in the human body. Papain is derived from papaya and is a natural chemical that may help fight infection. To Break Down Fats: Lipase (350 FIP): Lipase breaks down fats into smaller components which makes digestion easier. In the body, there are many different types of lipase, each with a specific role such as transporting cholesterol, breaking down butter and more. To Break Down Carbs: Amalyse (3,500 DU), Glucoamylase (5.3 AGU), Alpha Galactosidase (75 GalU), Invertase (150SU), Diastase (325 DP): These types of enzyme break down carbs and if you are eating a diet high in complex carbs (as you should), which is composed of raw fruit and veg it may help you avoid the common side effects of gas and bloating. To Break Down Fiber: Hemicellulase (1250 HCU), Cellulase AN (200 CU), Beta Glucanase (10.6 BGU), Phytase (3.1FTU): These digestive enzymes are present in fiber such as vegetables, and many people find that a diet high in fresh veg does lead to digestive issues such as abdominal pain and gas. Taking these digestive enzymes may help your body break down veg without associated side effects. To Break Down Milk Sugar: Lactase (150ALU): Lactase splits dairy produce containing lactose into sugars called glucose and galactose, making it more digestible. Lactase can help prevent symptoms of lactose intolerance such as bloating and diarrhoea. Herbal Blend (45mg): Ginger (rhizome), Fennel (seed), Peppermint (leaf). Three well known digestive herbs often used to sooth and ease indigestion, nausea, and other mild gastric issues. Caution: Not suitable for individuals under 18. Avoid if you are pregnant or breast feeding. Speak to your doctor before use if you are taking prescription medication or have an underlying medical condition. Speak to your doctor if you have undiagnosed digestive issues rather than turning to OTC supplements. There is some customer feedback posted on Amazon. However, according to scam software, there is a high level of deception going on so this does cast doubts over the many glowing customer reviews. In addition, many positive customers are urging new buyers to use personal discount codes in order to receive a $10 discount – this could be marketing ploy used by the company. I love this stuff! It definitely eliminated a lot of my bloating issues and I even got $10 off by using referral code 126389. There is negative feedback as well. Did not work. Made me more bloated. I feel like this caused bloating for me rather than stopping it. Really upset that I wasted my money. Some customers have mentioned other side effects. Garbage. Made me feel horrible. Terrible headaches and breakouts from using this and 2 others HUM products i tried. There is no money-back guarantee with this supplement. 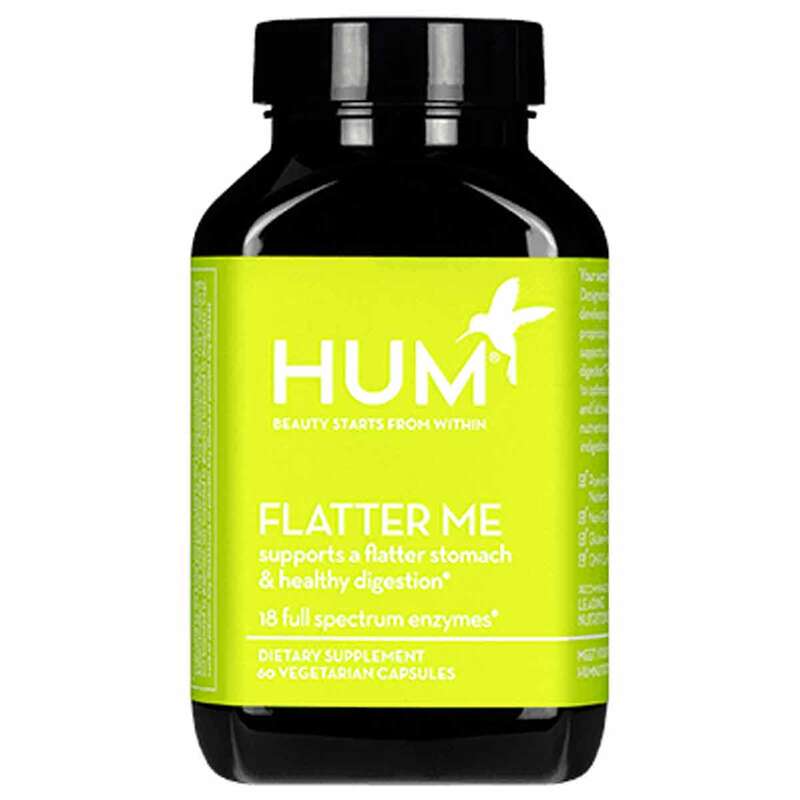 You can buy HUM Flatter Me via the official HUM Nutrition website or Sephora. It is also on sale via Amazon. HUM Flatter Me is not easily available to customers outside the USA. HUM Flatter Me promises to help you achieve a flatter stomach, but there is no real evidence that it will, and some customers have mentioned it causes bloating as a side effect. Taking a blend of digestive enzymes for general health in an OTC supplement is not going to work for most people, because this will depend upon your own body and your existing digestive enzyme profile. Getting it right for everyone is rather like trying to find a needle in a haystack! Of course, it may work for some people but then again, it may not. If you do suffer from digestive issues, it is important to visit your doctor because it could be a symptom of an underlying medical condition. According to gastroenterologists, if you have already done this and symptoms persist, dietary changes and chewing your food more may be just effective as most supplements. We don’t think that HUM Flatter Me is going to work, so we do not recommend this supplement to the Watchdog readers. How does HUM Flatter Me compare to Phentaslim?